This week's Roundup covers the last two weeks because of the lovely Thanksgiving holiday. Did anyone have any Rachael Ray recipes for Thanksgiving that were hits (or misses)? Talk Show Ratings Update: According to Broadcasting & Cable, "Rachael Ray had the largest increase among the talkers with a 13% jump from the week before to a 1.8. Ray's biggest draw was her A-to-Z Guide to Thanksgiving show, which cooked up a 19% increase to a 1.9 on Nov. 16." Rachael Ray told ET what she thought about the end of Oprah's show in 2011. Rach sent Diddy a pretty nice birthday present. And, busy bee that she is, Rachael also had time to crash an appearance by her buddy, Mario Batali. Elle Bee of Kitchen with Kids made Braised Sausages with Apple, Onion and Hard Cider Sauce. April of The Fragrant Hand shares her system for keeping track of recipes she'd like to try from Rachael's magazine. Michelle of Michelle Cooks Everyday is still working her way through Rachael's recipes - this time it was Chili Mac for One. 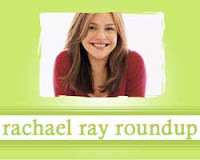 Writers and Cooks features a post outlining a change of heart about Rachael Ray. Brit of Steve and Brit's Blog made Italian Bean Soup. Man, I love the addition of the pesto. So crazy good. FitterTwit of Fun and Mental Changes is officially a fan of Rachael's recipe for Stuffin' Muffins. I couldn't agree more. Red Oak Hollow recommends Rachael's recipe for a 5-minute fudge wreath.